EIA forecasts that U.S crude oil production will average 9.4 million barrels per day (b/d) in the second half of 2017, 340,000 b/d more than in the first half of 2017. 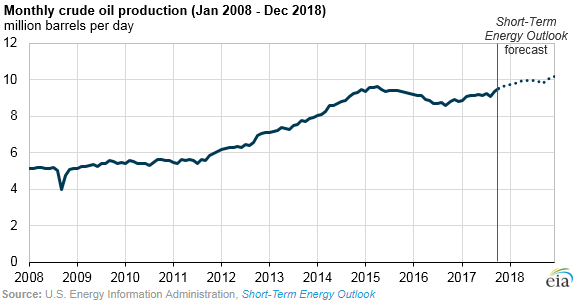 Production in 2018 is expected to average 9.9 million b/d, surpassing the previous high of 9.6 million b/d set in 1970, based on projections in EIA’s Short-Term Energy Outlook (STEO). The STEO projects that most of the crude oil production growth in the second half of 2017 will be in the Permian region, which extends across western Texas and southeastern New Mexico and has become one of the more active drilling regions in the United States. Production in the Permian continues to increase, in part, as a result of West Texas Intermediate (WTI) crude oil average monthly prices that have remained higher than $45 per barrel since the second half of 2016. In the STEO, EIA publishes crude oil production projections for Alaska, the Federal Gulf of Mexico, and the aggregated Lower 48 states. However, each month in the STEO, EIA models oil production for certain states and regions within the Lower 48 states. STEO’s projected U.S. production changes for the second half of 2017 are discussed in more geographic detail in the latest This Week in Petroleum, which includes information on production in the Permian, Niobrara, Anadarko, Bakken, Eagle Ford, Alaska, California, and the Gulf of Mexico. 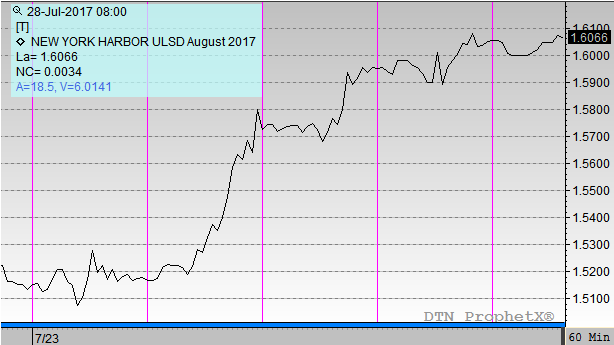 The STEO forecast is based on recent trends in drilling and production and on anticipated future changes, driven largely by the WTI crude oil price. EIA evaluates past production trends on a well-by-well basis for all production documented since 2014 and uses that history to estimate future well performance and production decline rates at the state and regional levels. In the Lower 48 states, rig counts typically follow changes in the WTI price with an approximate four-month lag. Changes in the number of active rigs lead to changes in production volumes within about two months. Consequently, the STEO oil production forecast is based on the observation that changes in production volumes typically occur about six months after a change in the price of crude oil. The forecast is also influenced by estimates of cash flow and production costs, which vary by region and over time. In addition, the outlook makes assumptions regarding how the inventory of drilled but uncompleted wells responds to price and how that response affects production at the state and regional levels. All historical production data in the STEO are benchmarked monthly to EIA’s Monthly Crude Oil and Natural Gas Production report and to EIA’s Petroleum Supply Monthly (PSM) estimates at the state level. The October STEO forecast for oil production is benchmarked to the PSM data for July 2017 that was published at the end of September.